Introduction: Currently MCA21 payments are allowed via Credit Card, Internet Banking & Physical Challan. The Ministry has authorized 5 banks (Indian Bank, HDFC, ICICI, PNB and SBI) for collection of MCA21 fees, which means that only the account holders of these banks can avail Internet banking facility. Further, payment via challan can only be made in the authorized branches of these above five banks. Though this was a major improvement compared to the earlier manual system, it caused delays in incorporation of companies and processing of other eForms. 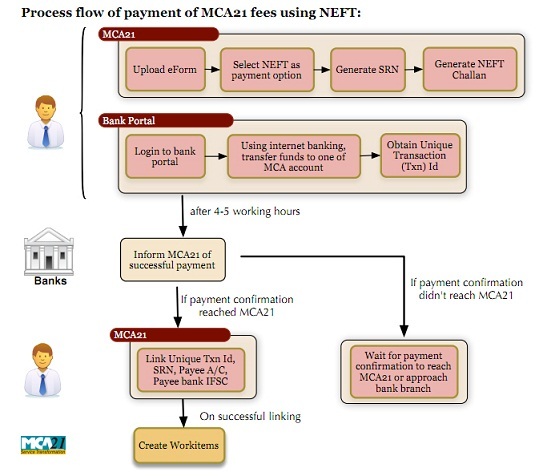 In order to eliminate inconveniences caused due to payment processing delays, Ministry is introducing payment of MCA fees via NEFT (National Electronic Fund Transfer) mode, in addition to already exiting payment methods. 7. It should be noted that for transactions involving stamp duty, there will be two SRNs (one for filing fee & another for stamp duty). Payment for these two SRNs should be made separately into the respective designated accounts. (1) SRN will expire if payment doesn’t reach MCA21 on time. Hence users should transfer funds well in advance taking into consideration of bank holidays and the settlement window. (2) Amount can’t be dividend into multiple payments. Full amount has to be transferred in single transaction for a particular SRN. (3) MCA Filing Fees and Stamp Duty Fees have to be paid separately into their respective accounts. NEFT is a nation-wide system that facilitates electronic transfer of funds from any bank branch to account holder of any other bank branch. The list of NEFT-enabled branches is available in the RBI website. Presently, NEFT operates in hourly batches – there are eleven settlements from 9 am to 7 pm on weekdays and five settlements from 9 am to 1 pm on Saturdays. NEFT transaction charges are available in the RBI website and are in addition to MCA21 filing fee. Ans: National Electronic Funds Transfer (NEFT) is a nation-wide system that facilitates individuals, firms and corporates to electronically transfer funds from any bank branch to any individual, firm or corporate having an account with any other bank branch in the country. Ans: For being part of the NEFT funds transfer network, a bank branch has to be NEFT-enabled. As at end-January 2011, 74,680 branches/offices of 101 banks in the country (out of around 82,400 bank branches) are NEFT-enabled. Steps are being taken to further widen the coverage both in terms of banks and branches / offices. Q.3. How can one know which bank branches are part of the NEFT network? Ans: The list of bank branches participating in the NEFT system is available on the website of Reserve Bank of India at http://www.rbi.org.in/scripts/neft.aspx. Details will also be available with the banks/branches participating in the NEFT system. Q.4. Who can transfer funds using NEFT? Ans: Individuals, firms or corporates maintaining accounts with a bank branch can transfer funds using NEFT. Even such individuals, firms or corporates who do not have a bank account (walk-in customers) can also deposit cash at the NEFT-enabled branch with instructions to transfer funds using NEFT. A separate Transaction Code (No. 50) has been allotted in the NEFT system to facilitate walk-in customers to deposit cash and transfer funds to a beneficiary. Such customers have to furnish full details including complete address, telephone number, etc. NEFT, thus, facilitates originators or remitters to initiate funds transfer transactions even without the need for having a bank account. Q.5. Who can receive funds through the NEFT system? The NEFT system also facilitates one-way cross-border transfer of funds from India to Nepal. This is known as the Indo-Nepal Remittance Facility Scheme. A remitter can transfer funds from any of the NEFT-enabled branches in to Nepal, irrespective of whether the beneficiary in Nepal maintains an account with a bank branch in Nepal or not. The beneficiary would receive funds in Nepalese Rupees. A separate Transaction Code (No. 51) has been allotted in the NEFT system to facilitate the transfer of funds from India to Nepal. Further details on the Indo-Nepal Remittance Facility Scheme are available on the website of Reserve Bank of India at http://rbidocs.rbi.org.in/rdocs/content/pdfs/84489.pdf . Q.6. Is there any limit on the amount that could be transferred using NEFT? Ans: No. There is no limit – either minimum or maximum – on the amount of funds that could be transferred using NEFT. However, for walk-in customers mentioned at Q.4 and Q.5 above, including those remitting funds under the Indo-Nepal Remittance Facility Scheme, the maximum amount that could be transferred is Rs. 49,999. Ans: No. There is no restriction of centres or of any geographical area within the country. The NEFT system takes advantage of the centralised accounting system in banks. For the purpose, the account of a bank that is originating or receiving funds transfer instructions through NEFT is operated centrally at Mumbai. The branches participating in NEFT can, however, be located anywhere across the length and breadth of the country. To facilitate operation of the Indo-Nepal Remittance Facility Scheme, the NEFT system also extends to branches of banks in Nepal (as detailed at Q.5 above). Q.8. What are the operating hours of NEFT? Ans : Presently, NEFT operates in hourly batches – there are eleven settlements from 9 am to 7 pm on week days and five settlements from 9 am to 1 pm on Saturdays. Q.9. How does the NEFT system operate? Step-1 : An individual/firm/corporate intending to originate transfer of funds through NEFT has to fill an application form providing details of the beneficiary (like, name of the beneficiary, name of the bank branch where the beneficiary has an account, IFSC of the beneficiary bank branch, account type and account number). The application form will be available at the originating bank branch. The remitter authorizes his/her bank branch to debit his account and remit the specified amount to the beneficiary. Customers enjoying net banking facility offered by their bankers can initiate the funds transfer request online. Some banks offer the NEFT facility even through the ATMs. Walk-in customers will, however, have to give their contact details (complete address and telephone number, etc.) to the branch. This will help the branch to refund the money to the customer in case credit could not be afforded to the beneficiary’s bank account or the transaction is rejected / returned for any reason. Step-4 : The Clearing Centre sorts the funds transfer transactions destination bank-wise and prepares accounting entries to receive funds from (debit) the originating banks and give the funds to (credit) the destination banks. Thereafter, bank-wise remittance messages are forwarded to the destination banks through their pooling centre (NEFT Service Centre). Step-5 : The destination banks receive the inward remittance messages from the Clearing Centre and pass on the credit to the beneficiary accounts. Ans : IFSC or Indian Financial System Code is an alpha-numeric code that uniquely identifies a bank-branch participating in the NEFT system. This is a 11 digit code with the first 4 alpha characters representing the bank, and the last 6 numeric characters representing the branch. The 5th character is 0 (zero). IFSC is used by the NEFT system to route the messages to the destination banks/branches. Q.11. How can the IFSC of a bank-branch be found? Ans: Bank-wise list of IFSCs is available with all the bank-branches participating in NEFT. List of bank-branches participating in NEFT and their IFSCs is available on the website of Reserve Bank of India at http://www.rbi.org.in/scripts/neft.aspx. All the banks have also been advised to print the IFSC of the branch on cheques issued by branches to their customers. For net banking customers many banks have enabled online search / pop-up of the IFSC of the destination bank branch. Q.12. What are the processing or service charges for NEFT transactions? (a) Originating bank branch in India – Maximum Rs. 5 (+ Service Tax) per transaction. (b) State Bank of India in India – Rs. 20 (+ Service Tax) per transaction if the beneficiary maintains an account with Nepal SBI Ltd. (NSBL). (c) State Bank of India shares this amount equally with NSBL. NSBL would not charge any additional amount for crediting the account of the beneficiary. (d) In case the beneficiary does not maintain an account with NSBL, an additional amount would be charged @ Rs. 50 (+ Service Tax) for remittances up to Rs. 5,000 and Rs. 75 (+ Service Tax) for remittances above Rs. 5,000. The charges for the Indo-Nepal Remittance Facility Scheme would, thus, be a minimum of Rs. 25 (+ Service Tax) or a maximum of Rs. 100 (+ Service Tax) depending on the value of transaction and the manner in which credit is afforded to the beneficiary. Originating bank branches have been advised to recover the entire charges from the remitter as per the structure detailed above and pass on the appropriate amount to SBI after retaining their share (of Rs. 5 + Service Tax). Q.13. When can the beneficiary expect to get the credit to his bank account? The timelines for remittances to Nepal using the NEFT system (under the Indo-Nepal Remittance Facility Scheme) are detailed separately at http://rbidocs.rbi.org.in/rdocs/content/pdfs/84489.pdf . Q.14. Who should be contacted in case of non-credit or delay in credit to the beneficiary account? Ans: In case of non-credit or delay in credit to the beneficiary account, the NEFT Customer Facilitation Centre (CFC) of the respective bank can be contacted (the remitter can contact his bank’s CFC; the beneficiary may contact the CFC of his bank). Details of NEFT Customer Facilitation Centres of banks are available on the websites of the respective banks. The details are also available on the website of Reserve Bank of India at http://www.rbi.org.in/scripts/neft.aspx . Q.15. What will happen if credit is not afforded to the account of the beneficiary? For example, if a customer submits a fund transfer request at 12.05 p.m. to a NEFT-enabled branch, the branch in turn forwards the message through its pooling centre to the NEFT Clearing Centre for processing in the immediately available batch which (say) is the 1.00 pm batch. The destination bank, if is unable to afford the credit to the beneficiary for any reason, has to return the transaction to the originating bank, not later than in the 3.00 pm batch. The originating branch is expected to afford credit to the originating customer, maybe within the next 30 minutes, (say) by 3.30 pm. To conclude, for all uncredited transactions, customers can reasonably expect the funds to be received back by them in around 3 to 4 hours time. Q.16. Can NEFT be used to transfer funds from/to NRE and NRO accounts? Ans: Yes. NEFT can be used to transfer funds from or to NRE and NRO accounts in the country. This, however, is subject to the adherence of the provisions of the Foreign Exchange Management Act, 2000 (FEMA). Q.17. Can inward foreign remittances be received through NEFT? Ans : No. The NEFT system can be used only for remitting Indian Rupees between the participating bank branches in the country. Q.18. Can remittances abroad be sent using NEFT? Ans: No. However, a facility is available to send outward remittances to Nepal under the Indo-Nepal Remittance Facility Scheme. Details of this scheme are available on the website of Reserve Bank of India at http://rbidocs.rbi.org.in/rdocs/content/pdfs/84489. pdf. Q.19. What are the other transactions that could be initiated using NEFT? Ans: The NEFT system can be used to pay credit card dues to the card issuing banks. A separate Transaction Code (No. 52) has been allotted in the NEFT system to facilitate the payment of credit card dues to card issuing banks. It is necessary to quote the IFSC of the beneficiary card issuing bank to initiate the bill payment transactions using NEFT. Q.20. Can a transaction be originated to draw (receive) funds from another account? Ans : No. NEFT is a credit-push system i.e., transactions can be originated only to transfer funds to a beneficiary. Q.21. Would the remitter receive an acknowledgement once the funds are transferred to the account of the beneficiary? Ans: Yes. In case of successful credit to the beneficiary’s account, the bank which had originated the transaction is expected to send a confirmation to the originating customer (through SMS or e-mail) advising of the credit as also mentioning the date and time of credit. For the purpose, remitters need to provide their mobile number / e-mail-id to the branch at the time of originating the transaction. Q.22. Is there a way for the remitter to track a transaction in NEFT? Ans: Yes, the remitter can track the NEFT transaction through the originating bank branch. It is possible for the originating bank branch to keep track and be aware of the status of the NEFT transaction at all times. Q.23. What are the pre-requisites for originating a NEFT transaction? l Name and IFSC of the beneficiary bank branch. For net banking customers, some banks provide the facility to automatically pop-up the IFSC once name of the destination bank and branch is highlighted/chosen/indicated/keyed in. Q.24. What are the other features of NEFT? Ans: Launched in October 2005, NEFT is an electronic payment system that uses a secure mode of transferring funds from one bank branch to another bank branch. NEFT uses the Public Key Infrastructure (PKI) technology to ensure end-to-end security and rides on the INdian FInancial NETwork (INFINET) to connect the bank branches for electronic transfer of funds. The participating banks, branch coverage and transaction volumes have been continuously increasing, which is reflective of the acceptance and popularity of the NEFT system. For further details about the NEFT system and the NEFT Procedural Guidelines – available on the website of Reserve Bank of India at http://www.rbi.org.in/scripts/neft.aspx . – may also be referred.